The sole purpose of doctors, nurses, and hospital facilities is to care for those suffering from injury or illness. Unfortunately, sub-standard care and treatment can become the cause of further injury. “Medical Malpractice” is a term used to refer to incidents in which doctors, nurses, and hospital facilities cause injury through negligent or improper treatment or care. Any improper action by a staff member of a hospital, by a doctor, by a nurse, by pharmacists, by dentists, and by technicians, can be considered medical malpractice. Common forms of medical malpractice include improper and mistaken diagnoses, failure to diagnose, failure to order the proper diagnostic tests, incorrect administration of drugs or treatment, botched lab reports or x-ray interpretations, failure to treat a patient at all, etc. The long-term ramifications of medical malpractice vary from patient to patient, but can range from slight injury to long-term disability and even death. The number of medical errors reported by Florida hospitals exceeds the number of medical malpractice claims filed each year by 6 to 1. About two-thirds of malpractice claims arise during hospitalization. Reports prepared by Florida’s Agency for Health Care Administration have compared reports of adverse incidents in hospitals to the filing of new malpractice claims. In the study generated by Public Citizens Congress Watch, Florida hospitals reported 19,885 incidents but only 3,177 medical malpractice claims. This means that for every 6 adverse incidents in the hospital only 1 malpractice claim is ever filed. 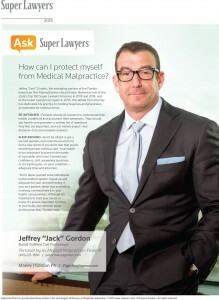 No matter what the injury, malpractice is subject to a very high legal standard that requires the victim to prove that the medical professional or medical facility owed a legal duty to the patient, failed to uphold the standard of care expected of such a medical professional or medical facility, that the breach of care caused an actual injury, and that the injury in question damaged the patient in some way. Given this high burden of proof, it is vital that someone wishing to pursue a medical malpractice claim seek the most qualified attorney to represent their interests. Contact Maney|Gordon Today for a Free Medical Malpractice Case Evaluation.